These are growing in number year on year and seem to be very popular. 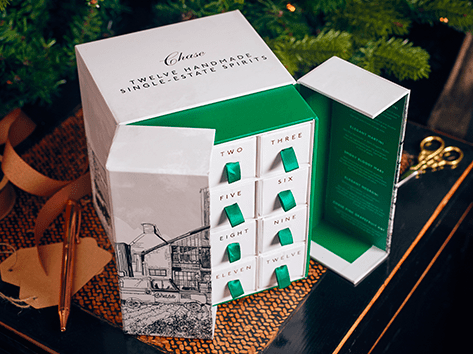 The options also vary greatly, for whisky advent calendars for example, the price entry level starts from under £100 to very old and rare whisky at around £10,000 (that is right!). 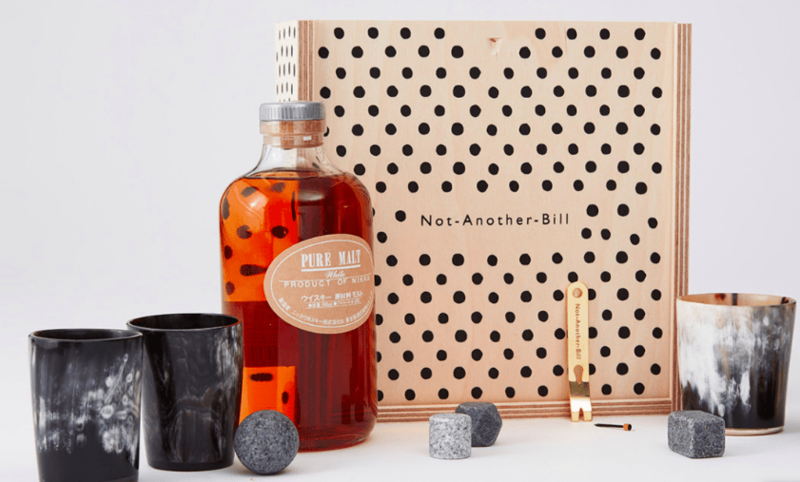 Drinks by the Dram produce advent calendars filled with (festive) alcoholic spirit such as gin, rum, bourbon, tequila, whisky, cognac, armagnac, vodka, mezcal, absinthe and even a naga chilli vodka escalation calendar! 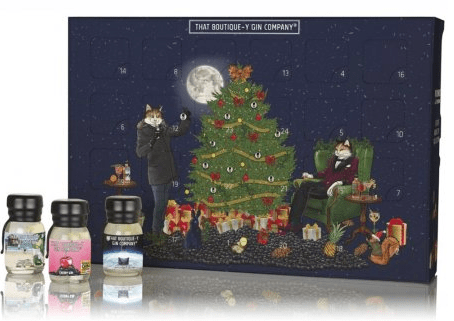 One such example is That Boutique-y Gin Company Advent Calendar (pictured above) which retails for £99.95 from retailers such as Master of Malt. Even Wine is available in this format as a gift, such as the one from John Lewis which retails for £70. 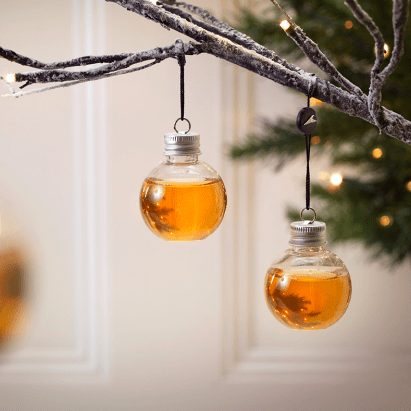 There are now quite a few options for alcoholic baubles for your Christmas tree, mainly from vodka, gin and whisky brands. 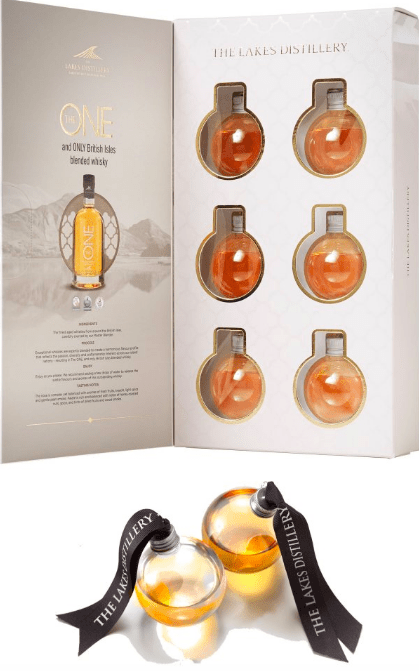 ‘The One’ British Blended whisky bauble from The Lakes Distillery (pictured above) is available at various retailers, such as The Whisky Shop for £29.95. A Scotch whisky option could be the Douglas Laing’s Remarkable Regional Malts available from Angel’s Share for £49.94 (for 4). 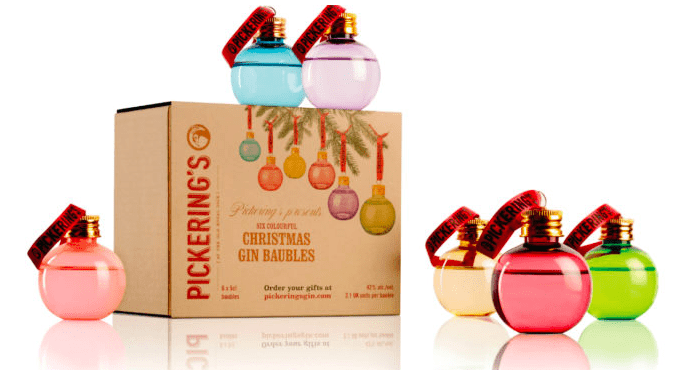 There are also gin filled Christmas baubles such as those from Pickering’s gin for £30 (for 6), pictured below. 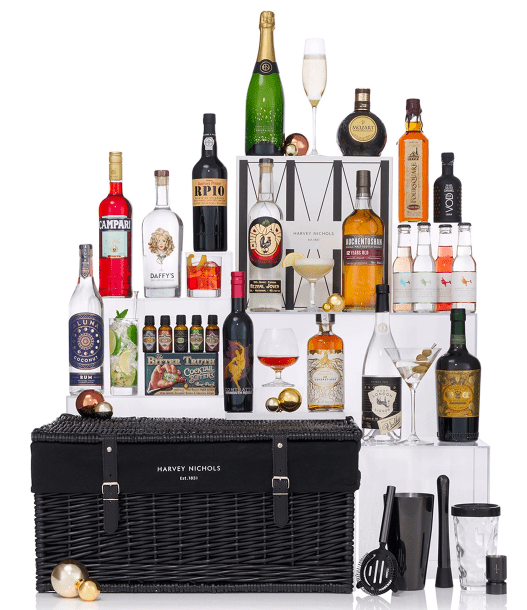 The concept of hampers originally started in France and the baskets full of treats were introduced to the UK back in the 11th century, although it was not until the Victorian era that giving such gifts became a popular choice. The railways development in the 1800s made it much easier to send perishable goods in hampers to friends and family around the country – and it became something of a tradition to send hampers at Christmas. Employers also used to present their staff with a basket of goodies at this time of year to ensure that they had a wonderful Christmas with plenty of festive food and drink to enjoy. 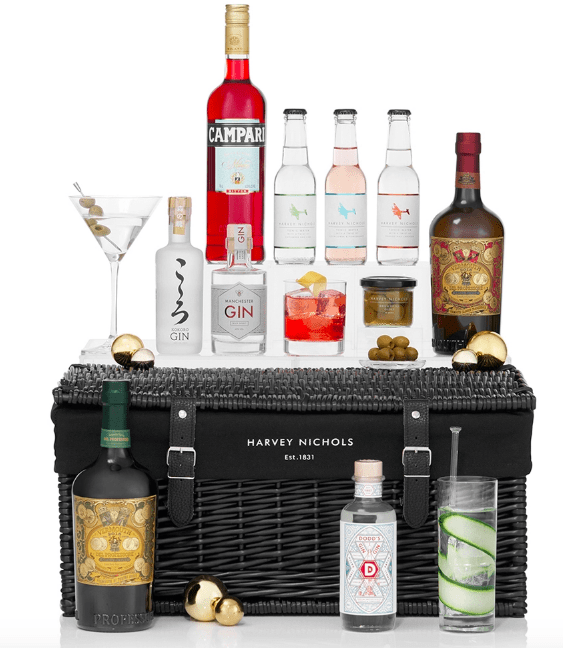 Harvey Nichols has a ‘Gindulgence’ hamper on offer at £165 (pictured below). Give the gift of a subscription to your friend or loved one, such as BeerBods’ Beer Club for 12, 24 or 48 weeks! 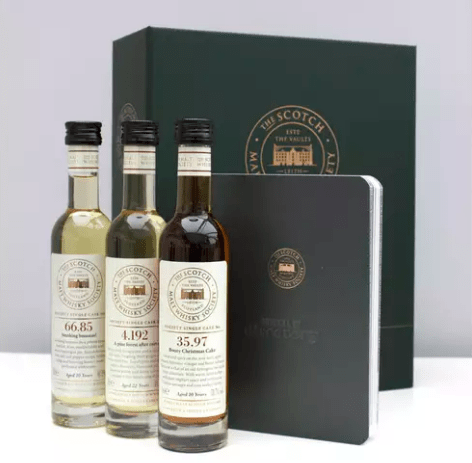 Or for the scotch whisky fan, perhaps a gift membership to the Scotch Malt Whisky Society from £80. If you are looking to give more than just a bottle, the gift set could be the perfect present. The price can vary considerably depending on the drinks category and brand. 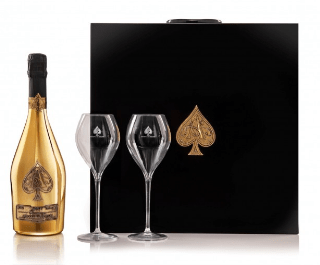 Harrods sells the Deux Flutes d’ Armand De Brignac set for £465. 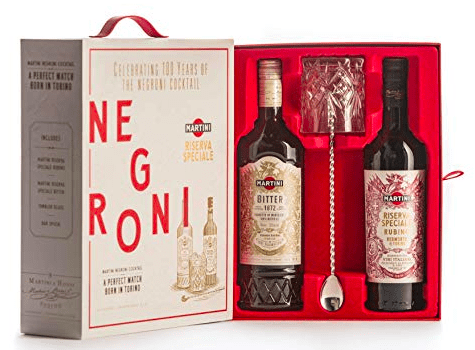 Amazon sells the Riserva Speciale Negroni gift pack by Martini for £35. 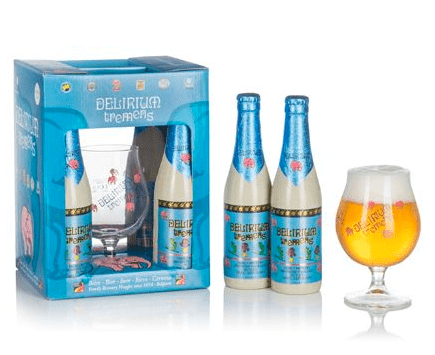 The Delirium Tremens Gift pack from BeerHawk at £24.99 is another such example for a more accessible gift price. 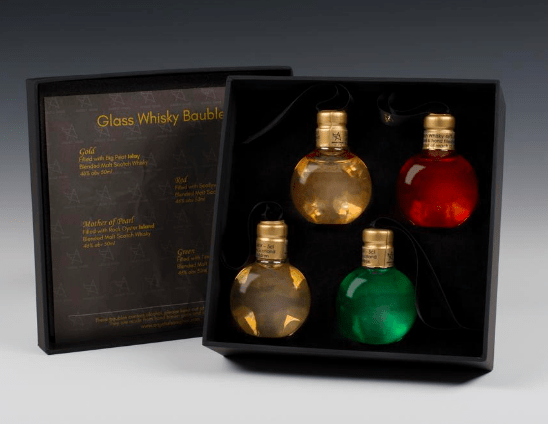 Chase Distillery has released the ‘Twelve Festive Single Estate Spirits’ gift set at £60. 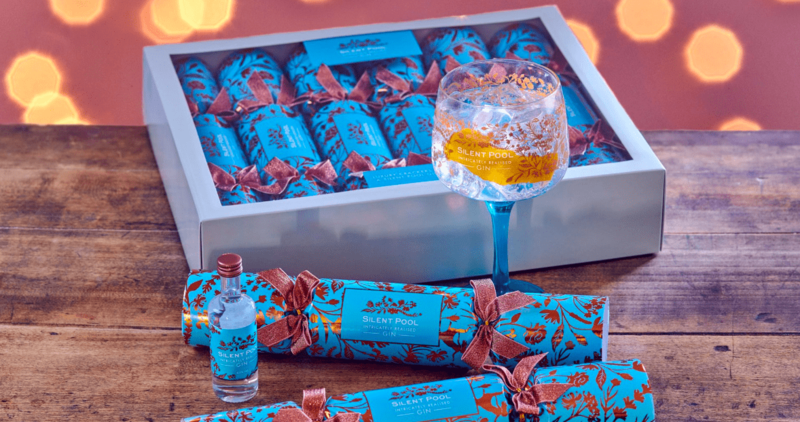 After all those presents, and to enhance the Christmas dinner experience, why not swap the usual Christmas crackers for whisky filled ones….such as those from Drinks by the dram and available from Amazon for £34.99, or the offer from Silent Pool gin. Most of us (adults at least) would much rather have a whisky than a toy car or tape measure I am sure!